I love to support small business. I have a heart for the little guy, if you will. I root for his or her success and physically patronize the business each chance I get. It’s something about the hard-working proprietor, the dedicated employees, and the care that typically goes into the well-thought out, earnest and carefully executed plans for the business…much like the blueprints my dad would painstakingly draw by hand before a building was erected…often well before the idea was even fully conceived…he would design a shelter, a haven, a launching pad for the notion. 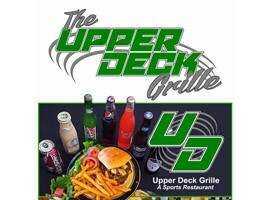 The Upper Deck Grille is one such establishment enjoying the benefits of a hard-working owner, loyal employees, a well-thought out menu chock-full of tasty meals, and an ideal location in the VF Mall (right around the corner from the movie theater). Hmmm…..not a bad idea for the guys to catch the game while the gals do a little Christmas shopping. Or the gals can catch the game while the guys take the kids to a movie. Whatever the preference, the outcome is the same. A satisfying meal. I’ve tried a number of different dishes, including the velvety chicken alfredo, the delicious parmesan chicken sandwich, the amazing Guinness battered onion rings (reminiscent of the ones Sadie’s Sideboard crafted), the boneless wings, and much, much more! I love the Memphis rolls! I don’t know if it’s because they remind me of Memphis where my dear little sis lives, or simply because they’re the best in town but either way, I can’t get enough of those things! An affordable price. Easily 2 of us can consistently eat for $25.00. Of course adult beverages will bring the price up a bit, but not unreasonably so. And if we’re just going for lunch or an early dinner, it’s a perfectly affordable excursion. If we choose to make a night of it, the crowd seems to be pretty fun no matter what night, based on friends’ tales and Facebook posts. An oasis in the midst of bustling Branson. The location is great for getting in and out without all of the traffic often associated with Branson. Situated on Gretna Road inside the VF Mall Complex, there is ample parking. Check out our deals page to find coupons and savings for this recommended establishment and other local favorites!